Ulvik is much more of a village than it is a city. With a population of only 1000 residents or so you can hardly call it a city. The city was once difficult to access but just last year a new suspension bridge slightly larger than the golden gate bridge was opened making access in and out of the town more accessible. 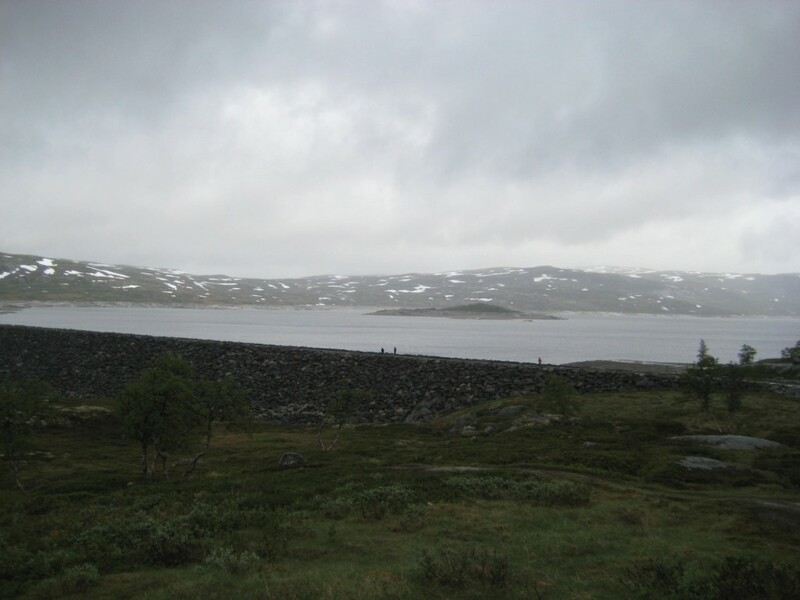 Our tour on this morning took us about 90 minutes drive out of town to the Hardangervidda Nature Center in Eidfjord where we saw an interesting film presentation on a 225-degree wide panoramic screen. The movie featured the local floral and fauna, waterfalls and canyons as seen from a helicopter. In addition to the film there was a very nice museum of taxidermy animals and exhibits showing what exists in the local area. There were birds, rabbits, rodents, elk, reindeer and more. Our next stop was a drive up to the Hardanger Mountain Plateau. The meandering roads along the rivers and fjords are scattered with homes and vacation cottages of all sizes and shapes. In the lower elevations of the area you find many fruit orchards including apples and cherries. This area is the fruit basket of Norway. As we climbed to the higher elevations we found that trees were no longer able to survive the climate and the land becomes much more barren. At the top of the plateau is a large man made reservoir and power plant. Not only was it raining at the reservoir but also the temperature had dropped into the 40’s. Snow can still be seen on the surrounding hillsides. 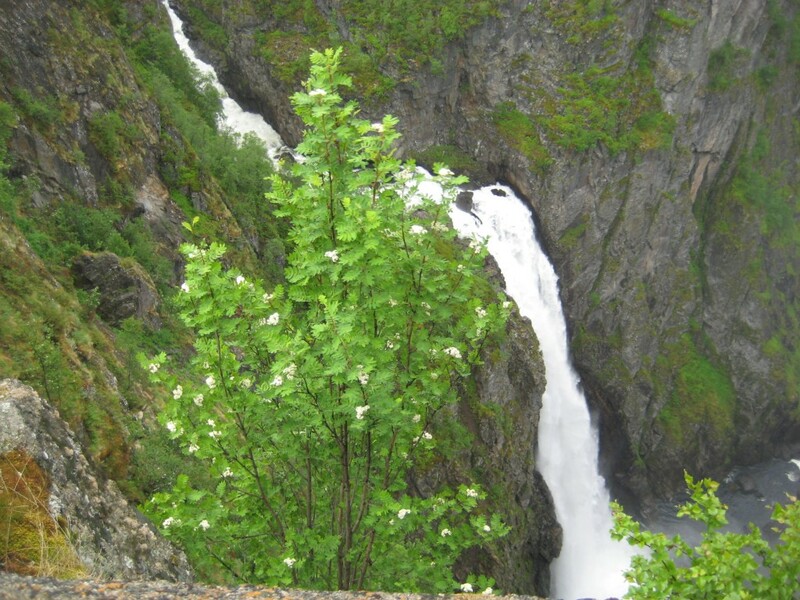 Between the melting snow and the rain you find many incredible waterfalls throughout the area. We stopped on our way back to the ship at an old historic hotel that started operating here more than 100 years ago, before modern roads were built and people could arrive by automobile. The hotel is still owned by the original family who started the hotel back in 1891. We enjoyed a variety of cakes, coffee and tea in the hotel. 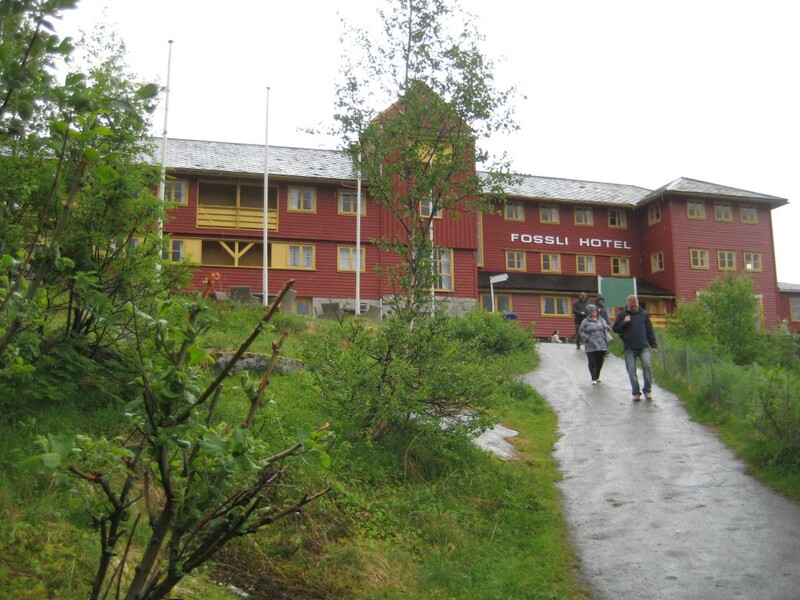 The hotel sits just above the Voringfoss waterfall that is a sight to see. The town of Ulvic is very small so there is little to see other than a few hotels, a juice and cider factory, the local church and a cemetery. Even though we have not headed too far north yet, we are experiencing very long days and very short nights. Sunset tonight was at 10:59pm and sunrise was at 4:14am. It seems as though the sun never sets and it is difficult to judge what time of day it is without looking at your watch. It is still light when you go to bed and light when you get up in the morning. We were invited to a cocktail party this evening in a lovely suite on the ship. Two new friends Dan and Elsie from Oakland and Berkeley were hosting the party in Dan’s cabin. Tonight’s dinner was another formal dinner with the traditional escargots, steak and lobster and soufflé for dessert. The entertainment was another show by the Ryndam singers and dancers called Droom. The show is like an enchanted dream garden, where mystical creatures both good and evil dwell. This production was one of the most elaborate we have seen on a ship with extensive costumes, props and video projected backdrops. These new shows are much grander than those we saw when we first started cruising in 1996.